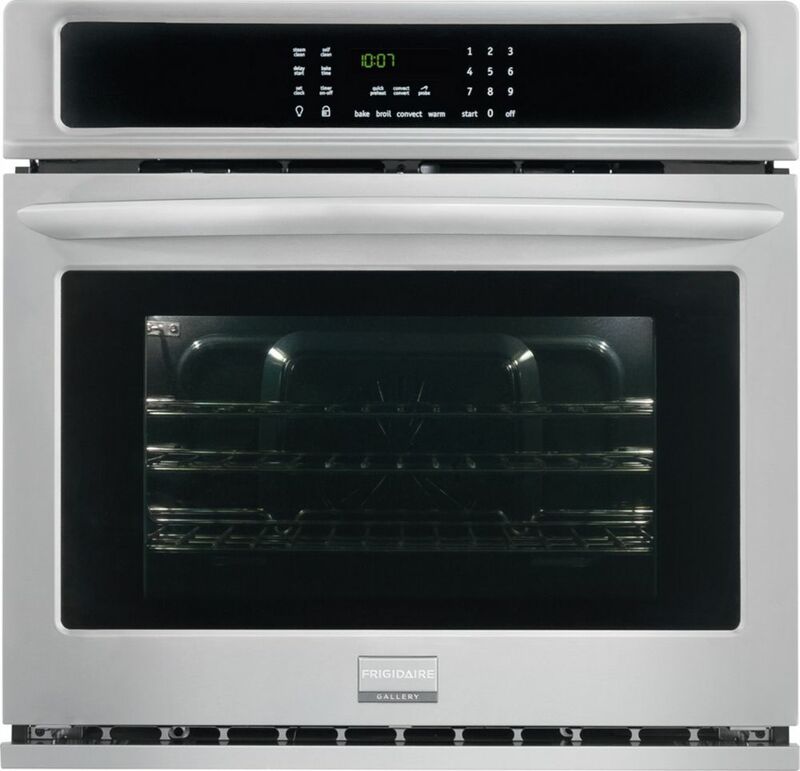 The Frigidaire Gallery 27-inch Electric Wall Oven features a large 3.8 cu. ft. oven so you have more room to cook multiple items. The Express-Select Control panel makes it easy to set cooking temperature or choose one-touch cooking options for baking and cooking at the touch of a button. With True Convection, the convection fan distributes heat throughout the oven for faster and more even multi-rack baking. Both ovens also include quick preheat, pizza button, and keep warm setting for all your cooking and baking needs. Gallery 3.8 cu. ft. Electric Single Wall Oven in Stainless Steel The Frigidaire Gallery 27-inch Electric Wall Oven features a large 3.8 cu. ft. oven so you have more room to cook multiple items. The Express-Select Control panel makes it easy to set cooking temperature or choose one-touch cooking options for baking and cooking at the touch of a button. With True Convection, the convection fan distributes heat throughout the oven for faster and more even multi-rack baking. Both ovens also include quick preheat, pizza button, and keep warm setting for all your cooking and baking needs. Gallery 3.8 cu. ft. Electric Single Wall Oven in Stainless Steel is rated 4.5 out of 5 by 110. Rated 5 out of 5 by tvalero from Exceptioal value and options that would please all users.beautiful looks that fits all kitchen de... Exceptioal value and options that would please all users.beautiful looks that fits all kitchen decors. Rated 4 out of 5 by Julius from Wall oven was easily installed and we are finding now... Wall oven was easily installed and we are finding now how it will performed. So far so good. Rated 5 out of 5 by Cd from Easy to install, fit perfectly. Works great, preheats quickly... Easy to install, fit perfectly. Works great, preheats quickly and cools efficiently. Looks fantastic! Rated 5 out of 5 by Jay from We are very happy with our new oven since our old one was 33 years old. We are very happy with our new oven since our old one was 33 years old. Rated 5 out of 5 by Great from We haven't used the features yet, but so far we... We haven't used the features yet, but so far we love the oven! Installed it ourselves - relatively straight forward except it was deeper than the one we took out requiring moving the electrical connection. Keeps accurate temperature, has fast preheat option. I don't find the fan overly loud.